Home featured Top News BREAKING : RED ALERT ! RED ALERT !! RED ALERT !!! BREAKING : RED ALERT ! RED ALERT !! RED ALERT !!! I am reporting with all sense of urgency about what conspired today in Odenigbo peoples parliament (a radio station program). 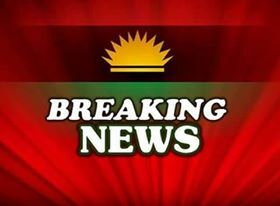 There is a serious warning to all Igbo's and biafrans especially those in anambra to be very careful. A young man that simply identified himself as ibrahim lawal called in on the radio program and dropped his submission as follows. "My name is ibrahim lawal, I dey call because I love ibo people. you see this soldiers wey dey come inside anambra, ibos should be careful, they are here to kill your people........" The man was cut off before he could finish revealing what he have for the Igbo people. This happened this morning the 23rd of august 2017. We are using this medium to once again to put the world on notice about the impending massacre of Biafrans in Anambara by Nigerian sponsored bokoharam members in army uniform. Any form of humiliation against our people will not be accepted, the world should take note. Odirachinma Ezeobi Reporting live from anambra state For Biafran reporters.